For today, I'm jumping ahead to write about Brothers because its fresh in my head. Because its still new in theaters, I should warn that there will be some mild spoilers. Brothers was a frustrating movie for me because there's a lot of good parts to it. However, the parts never come together. And after ranting about how movies are too long these days, I think this one left out too much. First of all, there's a pretty good story about Tobey Maguire's characters, Sam. Sam is a marine who leaves his wife Grace, played by Natalie Portman, and two young daughters to fight in Afghanistan. He is presumed dead, but is actually captured and tortured. He goes through an incredible ordeal before being rescued and returned home. But for this particular story, the interesting part of his character begins after he returns home. This is too late in the movie to develop what happens to him. Just before Sam leaves, his younger brother Tommy, played by Jake Gyllenhaal, gets out of prison. He becomes close with Grace and the daughters. I won't spoil the exact nature of the relationship between Tommy and Grace, as that's an important part of the movie. This story is also interesting, but the real fun should have been when Sam returned. Again, it was cut short. But the key missing ingredient is the relationship between the brothers Sam and Tommy. At the beginning of the movie we see Sam picking up Tommy as he is released from prison. Then Sam is gone. We don't really get a feel for their relationship. But near the end movie, it seems that this relationship plays a pivotal role in defining and defusing conflict. We get hints of what their relationship was like, but its all very vague and stereotypical. The father, played as a caricature by Sam Shepard, brings up how the boys were different. He clearly liked and had more respect for Sam, and the writer gives him every cliche just short of telling Tommy after Sam funeral, "The wrong son died!" We also get a hint of the brothers connection when Tommy mentions to one of Sam's daughters that Sam saved his life in a river. We see a quick pause on Gyllenhaal's face, but it's never mentioned again. I think it's thrown in there just to show that Sam has always been a hero. But wouldn't a moment like that define the rest of their lives? But exactly how? 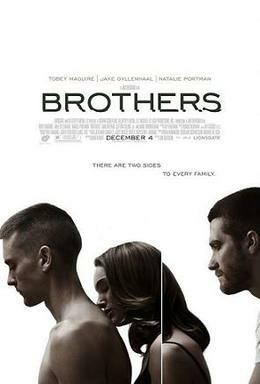 I think that for a movie called Brothers, there should have been more emphasis on that relationship. And even if the movie wasn't called that, it still should have been. I think it would have benefited from starting earlier in their lives. Show them as kids. Develop the relationship with their father to save it from cliche. Yeah, the movie is about the rise of one brother and the fall of the other. Everything revolves around them. But bring them together. And I'm also going to type something that I don't want to, but there needed to be less emphasis on Grace. I hate typing that because I don't ever want to see less of Natalie Portman. And she's actually very good in this, as are Gyllenhall and Maguire. I think that in the end, the makers tried to make a safe movie. They wanted a war movie that more people could go see and relate to. Too many scenes dance with melodrama, and that's not the right tone for this. Take off the safety valve. Let the characters grow and experience each other. This is a remake of a 2004 Danish film, Brødre. I'm intrigued to check it out to see if they went for a different style or take when remaking it for American audiences. Again, I think there are a lot of good things in this movie. There's something here. There's a really good movie waiting to come out.